This is the most popular tapas bar in Noia and it is situated in the medieval district of the town in a several hundred year old pazo. Tasca Tipica is close to San Martino church and has the la Parra bar almost opposite with yet another bar, Canton 17 just below it. 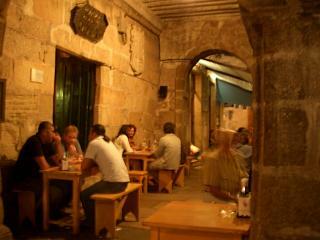 Right, many people take a drink or some tapas under the colonaded archway that sits in front of Tasca Tipica. This area has plenty of tables. This medieval area (in the Canton square) is one of two hubs when it comes to having a drink or a plate of tapas in Noia. Tasca Tipica is run by the proprietor Pepe and serves an extensive selection of not just tapas, but bocadillos and sandwiches. All the staff are friendly and helpful and you can expect the occasional salutation in English. You can eat alfresco under the colonnaded arches in front of the building itself, or in one of two areas within. The first area is the bar, whilst behind this and through a narrow archway lies the main dining area. 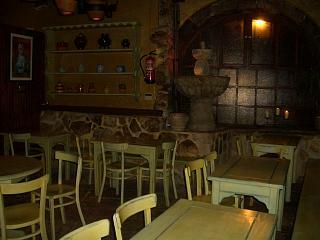 Left, There is an amazing restaurant area inside Tasca, a must for those who like something medieval and rustic. Both these sections of Tasca Tipica are very atmospheric and the internal décor, particularly of the dinning area, plays on the medieval history of the building. There is a coat of armour, exposed grantite walling, medieval style lighting and plenty for you to look at while you eat. All told eating in this bar at night will be an experience you will remember. If you eat at Tasca Tipica in the evening, try to get a table inside, but beware, it is always very busy. The tapas at la Tasca is as good as any we have had in Galicia and aside from the obvious calamares (deep fried squid) and puplo (octopus), you can order little chorizo like sausages prepared in wine, pimientos de Padron and chicken and mushrooms. If you are uncomfortable with the more unusual types of tapas, or want something that the children will eat, you can even opt for a plate of French fries. 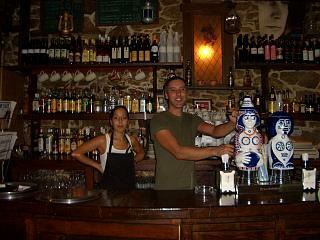 Right, The main bar area with owner and manager, Pepe, pulling a pint. Prices are very good value and you can easily share three racione sized tapas dishes between two, with drinks, for around 15 or 16 euros. Desserts are also available and it is also worth mentioning that we have received several emails from visitors to Noia recommending this bar and the friendliness of its proprietor. 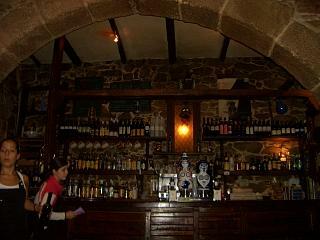 All told if you are in Noia and want a drink or something to eat, this is probably the bar to choose. Left, The large arched bar inside.